Andy Dufresne: Remember Red, hope is a good thing, maybe the best of things, and no good thing ever dies. Some things never change, which brings us to Adam Treu. More than 20 years after Johnson anchored the Raider defense in the 1976 Super Bowl, 10-year Raider Adam Treu was the starting Raider center for Super Bowl XXXVII against Tampa Bay (playing in over 150 career NFL games). Arriving on campus as changes were beginning to take shape, he should be able to give us a good idea of the tenor of the squad and the atmosphere around Memorial Stadium from his unique, homegrown perspective. Question: When was your last game as a Husker, Adam? Adam Treu: That would have been the Orange Bowl against Virginia Tech, I believe. Orange Bowl ’97, following the ’96 season. Q: Which had the Texas game where they slopped out on us and got the win? AT: Yeah, that was it. AT: ’92, I redshirted my freshman year. Q: You weren’t arriving at school from halfway across the country like some guys, but instead grew up in Lincoln. Can you recall anything special about that first day? AT: I think it was too early for me. I just happened to be at the right place at the right time, you know? I remember dressing up in the North Fieldhouse, making sure I had enough time to get ready for practice. 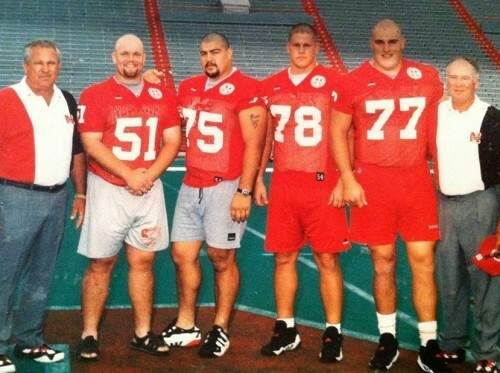 I was actually a defensive lineman my redshirt year, so working with Coach McBride and (John) Parrella and (Kevin) Raemakers and those guys, I didn’t know what I was getting into. Christian (Peter) was a young Christian, so he was pretty impressionable on some of those guys, some of those antics. And Paul, my dad worked as a carpenter in the Maintenance Department over there on North 17th over by the Devaney Center, and him and Bill Shepard and Tom Novak would always be in Shep’s shop. And he’d often stop by there on his way home, during the season he’d stop by the concession stand on Mondays for the leftover popcorn, he would bring that home. And as soon as I was old enough, I would go down there with my dad and his other co-workers on Saturday mornings and meet in Shep’s office and eat donuts, hear dirty stories, get to play with Shep’s grandson, Matt, and we’d go up and play in the handball courts or go down in the Schulte Fieldhouse and kick the ball around. I’d help put out the folding chairs back when Memorial Stadium’s box seats had folding chairs, and the end zone pylons, and then the pads on the goal posts and the American flags on the four corners of the stadium and the press box. And then I’d get to stay and watch the game up there, up in the four corners where the policemen would stand up there. We’d sit up there and watch the game. It was a dream come true, even more so than any other kid from Nebraska. I lived it. And when I got there, I walked on my first year. Milt and Coach Osborne said I wasn’t quite big enough yet, so they drafted a letter and sent it to me saying I was going to have a scholarship after the first year. I remember my Dad running off copies of it and putting it in a file and carrying one around in his pocket to show people. And he and my Mom -being an employee ticket holder since the Devaney years and basketball when they played over in the Coliseum- I didn’t realize until it was all said and done, but it was quite an experience. To live it and enjoy the success that we had was awesome. Q: Didn’t Shep always have a special cap that he wore? AT: Yeah, it was a red and white cap, with red polka dots. Q: That’s it! So let me ask you, your position coach was Milt Tenopir after your freshman year? AT: Yeah, they decided to move me to offense after my freshman year. Q: What do you think drove them to make that move? AT: I don’t know. Maybe I wasn’t mean enough. (laughs) I don’t know. Q: Your first year hanging around all those D-Line meatheads and Charlie, what was that experience like? AT: It was an eye opener. I never saw anybody that intense and crazy before. AT: In practice if you weren’t where you were supposed to be, you would hear about it. I was running scout team so I didn’t hear a whole lot about it, but the way Charlie McBride worked his guys until they were about ready to fall over, then he was ready to love on them all the same. He was like a father figure. Q: In what way did he go about it? AT: He’d take you aside, away from everybody and say, “I was just kidding” or “If I didn’t care, I wouldn’t get on you”, those type of things…. Q: Then you jumped over to the offensive side with Milt and Coach Dan Young. How was that? AT: Well, Milt was along the same lines. I think back in the day him and Charlie used to laugh and do one-on-ones against each other, in front of the offense and defensive linemen. Milt, he didn’t have a lot of rules; but the couple he had, boy, you had to adhere to them. And Dan, he was kind of the passing game coach, I guess you would say. He’d throw his two cents in there every once in a while. Two really great guys, you could tell their love for one another, all the time they’d spent together. They were brothers in a sense. You could talk about the reasons for success: it was like one big family. That staff had been together for so long that they knew what the other one was thinking, and it was just unbelievable. Q: You said Coach Tenopir didn’t have many rules. Can you recall the few he did have? AT: “Just don’t screw up your assignment” and “Don’t sleep in the meetings.” (laughs) The cot over in the corner of the office was his… and we looked forward to the fish fry at his house after the Spring Game every year. That was a good time. Q: What would happen at the fish fry? AT: Just reminiscing and making new stories, shooting pool, drinking a few ‘sodas’. (laughs) All my other classmates, the same age as me, we all stuck together outside of football, and there are guys I still talk to often throughout the year: Matt Vrzal, Korey Mikos, Chris Dishman I still keep in touch with. Q: How did Milt always turn out those great groups of offensive linemen? AT: It was the trust factor and the fear of letting one another down. And with the tradition being what it was, you didn’t want to be that team that didn’t win 9 games a year. It was like Wahoo basketball, where they won 115 straight or something like that. Milt’s scheme wasn’t that difficult and easy to learn. It was simple, so you could just play. Think about how many guys we had out there: we had 4 stations running (with both scout teams and substitutes), so the number of plays you could run in a practice -the offensive running set was over on the left side, the offensive pass set was over in the south end zone- you knew without communicating what the guy next to you was going to do against certain looks. I mean, you didn’t have to worry about where you were going. Q: So once Saturday came around you were operating as a team rather than a bunch of individuals. Was it ever like that in the pros for you? AT: We did. We had a good line there for about three years, Gruden’s last two years and Callahan’s Super Bowl year. We had good ‘character guys’ in starting positions that influenced the rest of the team. They weren’t afraid to say what they were thinking, they made sure everybody toed the line, they didn’t care how much this guy made or that guy made, they were gonna let it be known what they thought. We were pretty good for about 3 or 4 years, we won some AFC West titles, lost to Baltimore that year in the Championship game, and the next year we win it and go to the Super Bowl. I can relate those three years to those years at Nebraska, where we had enough character guys who loved the game and played it for the right reasons, to where it would wash away or cancel out the guys who didn’t have it, who were doing it just for the money or whatever. Al (Davis) didn’t have a lot of rules. His coaches didn’t have a lot of rules and sometimes it would get taken advantage of, so that was the hardest thing my last few years, a lot of them guys were done playing and the younger guys would come in, and the yahoos started acting like they weren’t supposed to, that’s what they were. It was still hard. I had a few close friends on the team, but it was the putting up with a lot of the B.S. that was pretty hard on me. Q: And as far as Nebraska goes, do you have a particular game or moment that stands out to you as a favorite? AT: I think it was the game against Florida in the Fiesta Bowl when I was a junior. I think we were considered underdogs in that game and we’d been lighting it up all year: our defense, our special teams, and just that look on Spurrier’s face over there, the disgust was just unforgettable. I remember just trying to get out of Lawrence Phillips’ way that game. I was the swing tackle, so (Eric) Anderson and (Chris) Dishman would start and then I’d come in. I’d go in after a series or two and then take one series at left and then another series at right tackle. It was just making sure we were all fresh. Q: That was part of the method to the madness? AT: I think that just through the conditioning program that you guys put on, the number of reps we would take during practice, that was even more conditioning than we ever knew. Running all those plays throughout the practice was very beneficial. And it was as live as could be, except for the scout team. And you had guys on the scout team, they were waiting their turn, they wanted to show what they had, so they were all busting their humps to impress, too. Q: Who did you run up against in practice the most, made you a better player? AT: Probably John Parrella or Raemakers, going against them when I was young; getting that eye-opener. Q: What made the teams special? AT: Just the way the whole thing was run: top of the line, first class everything. Weight room, training table, having practice in the afternoon and -not being catered to- but giving everybody a chance to succeed was big. And then, of course, Osborne was such an even-keeled guy, you didn’t want to disappoint him. But you knew if you did that he understood that you were human and he would talk to you. He could have a pleasant conversation with you.